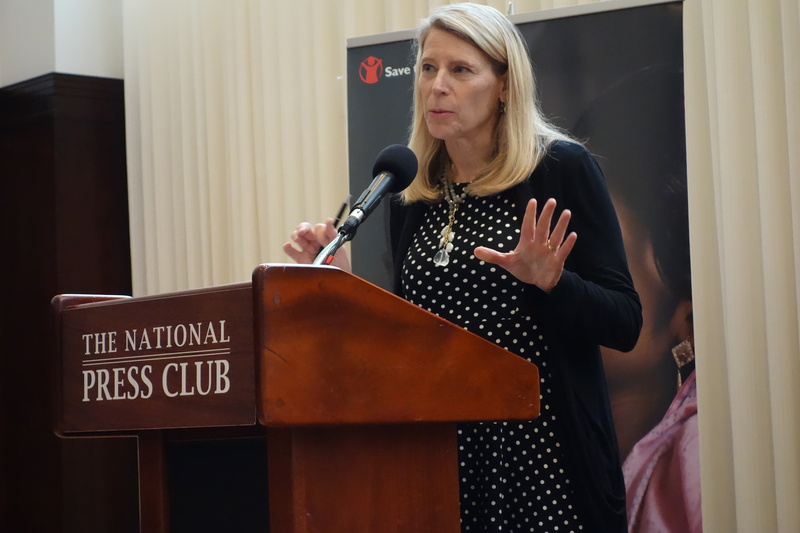 June 10, 2015 – Washington DC: Save the Children launched a new report today (click to download pdf) assessing the results of USAID’s “Local Solutions” initiative in the Philippines. It was launched in partnership with the Brookings Global Economy and Development at the National Press Club. Save the Children president Carolyn Miles introduced a panel moderated by Brookings Senior Fellow George Ingram featuring USAID’s counselor Susan Reichle and leaders of two participating Filipino organizations: Marissa Camacho of the Ayala Foundation and Eugenio Gonzales of The Phil-Am Fund. Consistent with the Paris Principles on aid effectiveness, “Local Solutions” is part of the Obama administration’s “USAID Forward” reform package focused on increasing the share of US aid that supports local institutions — with a target of 30%. USAID-Philippines has exceeded that target, channeling 40% of its funding through local organizations. In the specific project presented at the launching and highlighted in the report, USAID funded a consortium headed by the Ayala Foundation to provide capacity building to 120 local civil society organizations (CSOs) – including 21 that were networks of hundreds of smaller organizations – to the point where they could meet standards to be eligible to receive, manage and account for USAID funds. More than 90 of them met these standards. The Phil-Am fund then managed a competitive-bid grant-making project with grans won but a number of these groups. The importance of this capacity-building project to participatory democracy is that it has coincided with implementation of a massive reform program for Bottom-up Budgeting (BuB) in the Philippines where CSOs are directly involved with facilitating local-level participatory budgeting that passes upwards to the ministries. It has enhanced the ability of smaller organizations to be supported by the government to facilitate these local processes – a mechanism that has previously worked well in the People’s Plan Campaign of the Indian state of Kerala. (For a process assessment of BuB – click here).